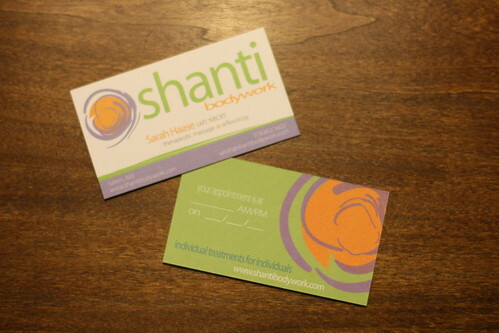 Shanti Bodywork Business Cards, originally uploaded by Hannah Cloud. The business cards I designed for Sarah have arrived! They look pretty good, especially considering she got them dirt cheap via vistaprint.com. I have a love hate relationship with vistaprint--because they are so reasonable, it's hard not to love them, but I am looking into working with a higher quality print house for my etsy stuff since I find that vistaprint has quality control issues when it comes to their cut lines and color control. Additionally, they don't offer many paper types and no recycled option. Still, hard to complain when you can get 500 business cards for 30 bucks.